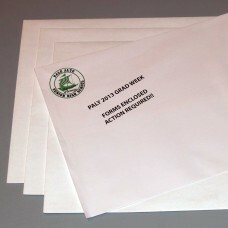 Advances in high-speed laser printer technology make it possible to print great looking envelopes using a digital press. Combined with so-called variable data input, digital printing allows for personalized addresses to be printed similtaneously with the return address. And digital envelope printing in color is affordable for smaller order quantities. Of course, the traditional way of printing envelopes -- offset printing -- still has its advantages at higher quantites so we partner with top area trade shops to offer competitive pricing for top quality envelopes. Please contact us using the link below for quotes on quantities over 1000. We offer both Commercial No. 10 and No. 9 sizes as well as various annoucment and catalog envelopes in a choice of papers. If you don't see what you need, please contact us.